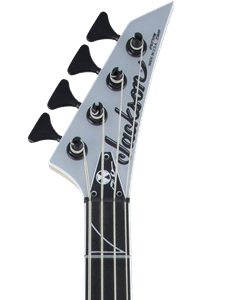 Brimming with technology and style, the Jackson Pro Series Monarkh SCQ is an amped-up, hot-rodded metal machine, aimed at the demanding player who needs a no-compromise performer. Enjoy unparalleled consistency and tonal variety at any volume level, from the quietest whisper to a mighty roar, while experiencing the bleeding edge of modern guitar craftsmanship and construction. 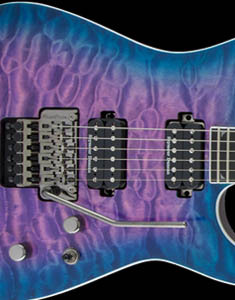 The Pro Monarkh SCQ features a 24.75" scale length, mahogany body with an arched quilt maple top and a speedy one-piece set maple neck with a scarf joint and pair of graphite reinforcement rods, providing stiffness and high stability to guard against temperature- and humidity-induced bending and warping. 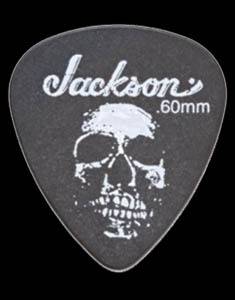 Enjoy Jackson’s familiar and effortless playing feel with a 12”-16” compound radius ebony fingerboard featuring 22 jumbo frets and pearloid ghostfin inlays. The modern-day metal guitarist requires tonal versatility and super clarity to keep up with the rapid twists and turns of modern metal. A classic Seymour Duncan® humbucking combo delivers all that and more, from heavy riffage to creamy leads. 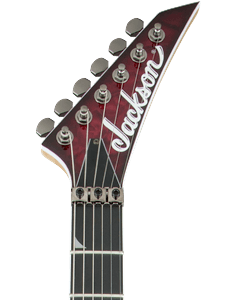 The Jackson fully adjustable radius compensated bridge creates perfect intonation along the entire length of the neck to ensure complex chords ring true, while the anchored tailpiece and die-cast locking tuning machines work in harmony for tuning stability that can withstand a good pick-hand thrashing without shifting. Cloaked in classic Jackson style, the Pro Monarkh SCQ is available in Alien Burst, Transparent Purple or Satin Amber and features black hardware and three-ply binding around the body, neck and 3x3 AT-1 headstock.